From producer James Wan comes a tale of an unknown terror that lurks in the dark. When Rebecca left home, she thought she left her childhood fears behind. Growing up, she was never really sure of what was and wasn't real when the lights went out...And now her little brother, Martin, is experiencing the same unexplained and terrifying events that had once tested her sanity and threatened her safety. A frightening entity with a mysterious attachment to their mother, Sophie, has reemerged. But this time, as Rebecca gets closer to unlocking the truth, there is no denying that all their lives are in danger...Once the lights go out. James Wan was just at WonderCon in Los Angeles, where he debuted the first trailer for the new horror experience Lights Out! David F. Sandberg directs Lights Out, which is coming to theaters this summer from New Line Cinema. He is an accomplished short film director known for such genre favorites as Attic Panic and Closet Space. Lights Out will mark David F. Sandberg's terrifying feature film debut. Teresa Palmer headlines Lights Out. An Australian native, she has become a favorite amongst horror fans. She made her debut in the cult classic Wolf Creek in 2005. She then went onto take a role in The Grudge 2. She also starred in the zombie romantic comedy Warm Bodies. She was most recently seen in this past Christmas' Point Break remake, and appeared in Triple 9, which just arrived in theaters earlier this month. 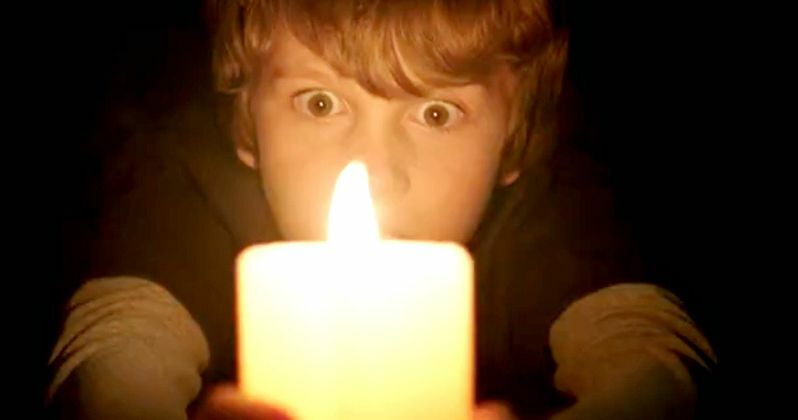 The rest of the Lights Out cast is rounded out by Alicia Vela-Bailey, Amiah Miller, Gabriel Bateman and Maria Russell. Also appearing in the movie are Billy Burke and Maria Bello. This isn't an R-rated shock fest. Lights Out is rated PG-13 for terror throughout, violence including disturbing images, some thematic material and brief drug content. Sounds like a winner, right? Get your first sneak peek in the just released trailer! Just be sure to leave the lights on!